When you watch a lot of crime dramas, it’s inevitable that you’ll start to view your own surroundings with the eye of a police investigator. Not a real detective, though. I have no idea how they actually do their jobs. I’m a trained flatfoot in the long illustrious tradition created by Arthur Conan Doyle; that is, clues are everywhere and you just have to notice them, and whatever you find has profound significance to the way the DB was killed. See? I told you I watch a lot of these things. DB = dead body. Now let’s take a quick look at my murder scene. There I am, dead. The circumstances are very suspicious indeed. Tras was in Venezuela so he’s not a suspect. All my children have airtight alibis as well. In other words, anyone that could legitimately want me dead is in the clear. So let’s look at the evidence surrounding my person and see if we can find the killer. 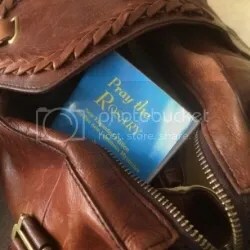 There’s a booklet entitled Pray the Rosary in my purse. You know what that means. The victim is a Devout Catholic. Is there any other kind? Sort of like Observant Jew, the religions all have their built-in modifiers. So naturally, since I’m a Devout Catholic, the killer must be someone from my parish. The priest is a likely suspect. Nuns are even better; after all the Beatles put “creeping like a nun” into our collective consciousness. So a creeping nun is a guilty nun. Case solved. Keeping it real: I do have a copy of that booklet in my purse. I only vaguely remember how it got there. My mother may have given it to me, or I could have actually picked it up after Mass, where I go on Sundays. So give the poor nun a break. I was killed at home, and there’s a knife laying on the counter. It, therefore, must be the murder weapon. Test that thing for my blood (which has been wiped off, but you know they can still detect it). 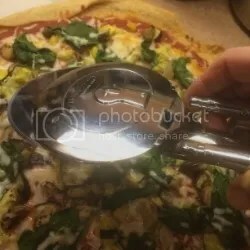 Because you know, a kitchen implement that’s out of place is a big giant clue that screams Murder Weapon. Reality: There are very few knives, mixers or other kitchen implements of destruction that are actually put away in my non-gleaming kitchen. Any one of them could have killed me, according to this theory — even the bread maker. (It might have it in for me. Bread maker: I have my eye on you.) Anyway, in what universe does a home, especially with children, exist in a state of House Beautiful? Especially when its mistress is lying in a pool of blood. My car radio station was tuned to the local pop station. This is practically definitive evidence that I’d been carjacked, held at gunpoint, forced to change the radio station off NPR, and brutally killed by a teenage terrorist. After all, why else would my radio not be tuned to the news, which as anyone who lives with me, lives near me, or works with me knows, I never listen to anything else. If it’s news, I’m there. Also there for public radio shows, like This American Life, Fresh Air, Serial, or Invisibilia. Oh I do occasionally listen to a couple of classic rock stations, which, shockingly, play songs from the ’80s, which as everyone knows, was just a couple years ago. (I graduated from college in 1985.) That stuff’s CURRENT, man. Sigh. Anyway if Kanye West and/or Lady Gaga was blaring from the Prius speakers, somebody else was in the car. Case closed. Reality: I’m currently obsessed with Uptown Funk. Every time I get in the car I turn to Your Pop Station in order to sing at high volume along with Bruno Mars. About 60 percent of the time I do. Don’t believe me — just watch! Heh. Another reality is that I’m most likely not the enigma I believe myself to be. Having children means you’ve got people to detail, in the most unflattering way possible, each of your habits, quirks of speech, how you laugh, how you answer or say good-bye on the phone, etc. Also to enumerate how many times you’ve told a particular story about your days in band. So please, show this to the police when my lifeless body is discovered in one of the above scenarios. Contact my office, where I’ve got a current approved photo on file that can be given to the media. This is totally true. I don’t want unflattering Facebook photos to be splashed all over the newspapers (are too still newspapers!) and the Action News. What? I like to plan ahead. I was fixin’ my hair this morning, musing about Jeopardy. I like to watch Jeopardy; it makes me feel smart. There I loaf, upon the sofa, yelling out the answers with no pressure. I have no “signaling device” to contend with and don’t have to ring in. If I read ahead, I can gleefully answer before the contestants do, and therefore I am smarter then all three put together. It is a testament to my pathetic obsession with my own superiority that I recall fondly times I’ve watched Jeopardy in public, answering easy-peasy questions left and right, to the admiration of the gathered throng. Actually, a couple of times people have said, “Ooo you should try to get on,” and that’s about it, but hey. You take your compliments where you can find them. So anyway, back to this morning. I was thinking how occasionally a contestant will admit that the part that scares them the most is having to talk to Alex. 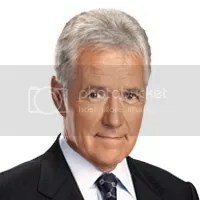 Though I have no problem chatting with anybody — even Alex Trebek, should he emerge in Kentucky — but it’s the pressure of having something interesting to tell him that worries me most about my fictitious Jeopardy contestanthood. What have I achieved in my 50 years on this planet? What are the accomplishments which set me apart from other, ordinary, humans? Failing that, what memorable events have I participated in? Witnessed? Documented? Sure, there’s all that stuff about eating squirrels and meeting Cheryl Ladd, Tommy Smothers, and Richard Dreyfuss — but celebrity-spotting is fairly ho-hum for the L.A. and New York crowds. The fact that Dreyfuss grasped my hand like a courtier and bowed before me is mildly amusing, but I get the idea I’m not the only tall woman he’s looked up to. I have birthed three wonderful children, it’s also true, but we all know that any fool can reproduce. I have an plan to create tasteful and funky jewelry made with antique and vintage Catholic medals — but craftiness is hardly a news flash. Anybody with a Pinterest account can tell their world about their mad artistic skillz. What would make me a good story? I have no idea. I love to tell others’ stories and I know a good story when I hear one. Hard-pressed, I could even make up a story … but my sad forays into fiction-writing tell a far truer tale of a puny imagination. I guess it will be up to history to decide if my presence has left a lasting enough mark. When early 21th century writers are recounted, will my name be among them as one who fearlessly elucidated upon the picayune? Charles Kuralt made it his life’s work to illuminate unseen corners of the human experience. So did Studs Terkel, Ira Glass, and here in Kentucky, Byron Crawford and Bob Hill. I have no illusions my name would ever be included in a Jeopardy category featuring the most interesting people in the world. Or even in a category about people who wrote the stories of interesting people for others to read. In truth, it’s my lack of depth in subjects such as state capitals, vice-presidential history, and the British monarchy that ultimately will keep me off Jeopardy. But truly, I’d never have the nerve to become a contestant. I’d have to admit that the only thing that sets me apart is my ability to correctly answer Jeopardy questions from the safety of my living room. It’s December 2 and the Annual Assault of Christmas Music has begun. Here’s a ranty post from a couple years ago to get you in the Grinchy spirit. When I was a sophomore in high school, I appeared in the classic musical Mame, and in a high school which cranked out a musical every spring, it was a show-stopper. I will never know, objectively, just how high the level of talent and how rich the level of entertainment this production provided, but now, more than 30 years hence, I can say unequivocally that it was the best thing staged at Carroll County High School in April 1979. American Movie Classics has been running its traditional Halloween scare-a-thon movie marathon, and yesterday I watched a little bit of a zombie movie. Like everyone, I am captivated by the undead. What makes zombies so interesting is that they move around sort of like living humans, but they’re deadly dangerous, have no sexual allure whatsoever (unlike vampires) and their existence puts survivors into all sorts of moral quandaries. It’s why The Walking Dead is so popular. While arrows to the eyeballs is fun a couple times an hour, you really can’t take a steady diet of close encounters with rotting flesh. So, like The Stand, most of your time needs to be spent on how the living cope with the apocalypse. Stephen King, when writing The Stand, chose a deadly strain of the flu virus to wipe out 99.7 percent of the population. Zombie movies and TV shows routinely blame a virus for “infection” and the spread of zombification of human beings. World War Z, for example, mostly occupied itself with finding the originally infected human and, for a zombie movie, wasn’t particularly scary. The scrabbling mass of CG undead humanity was awesome, however. So when I turned on AMC I was thrilled to find the Hollywood zombie purveyors had kicked it up a notch and given us what we want: horrible zombies who eat the flesh of the living on a plane. Yes, the title of this movie was Flight of the Living Dead, which I totally wish I had made up. Actually they probably did come up with the title first and then built the movie around it. Zombies! On a plane! It’s even better than Snakes on a Plane — although, no, it didn’t have Samuel L. Jackson, so it could definitely could, by definition, have been more awesome. As a matter of fact, why didn’t they get Samuel L. on board for this project? I mean, come on. He needs to be the go-to guy for terror in the skies. I confess I didn’t watch more than about 20 minutes of the movie, which was billed, as I later learned on IMDB as “action horror.” But of course I didn’t have to; you know what happens. The zombies get out, bite nearly everyone, and they chase the remaining people — who not only have to fight the undead but cope with the fact that they’re 30,000 feet from terra firma, which is where all good zombies need to be. Preferably, beneath it. I was amused by the periodic shots of the big ole jet airliner, taken from slightly above and always covered by flashing, menacing lightning. It reminded me of Airport ’75 (1974) with Karen Black flying the plane, her slightly crossed eyes locked on the instrument panel as she winged a 747 over mountain peaks and brought nuns and sick children safely to the ground. The movie is a few years old and I might try and scare it up sometime. Even though I enjoy zombies the year ’round, there’s really nothing like Halloween to really bring the undead to life. Gives you an appetite for it, you might say. Thank heaven writing about these undead ruminations and unsavory combinations only strike me about once a year — although if you put a corpse in some fetching footwear you might captivate me a whole lot more frequently.